Real estate tycoon and former senator Manuel Villar is now worth $5 billion (Php267.3 billion), according to the newest Philippine rich list published by business magazine Forbes. That’s more than triple his $1.6 billion net worth last year and makes him the second richest person in the country, his highest rank since he was first included in the exclusive list in 2006. He replaces tycoon John Gokongwei Jr, who is now No. 3 on the list as his net worth fell to $4.4 billion from $5.5 billion last year. Forbes attributes the increase in Villar’s net worth to his memorial parks operator turned real estate developer Golden Bria Holdings, whose share price saw a 1,300-percent increase early this year. He also benefits from his holdings in two other listed companies, mall operator Starmalls Inc. and low-cost property developer Vista Land and Lifescapes. Villar, who also heads the Nacionalista political party and was a defeated candidate in the 2010 presidential elections, is a close ally of President Rodrigo Duterte. His son Mark is the public works secretary while his wife Cynthia is a senator. A daughter-in-law is now justice department undersecretary. Related story: Did Market Speculation in Golden Haven Help Double Manny Villar’s Net Worth to $3B? 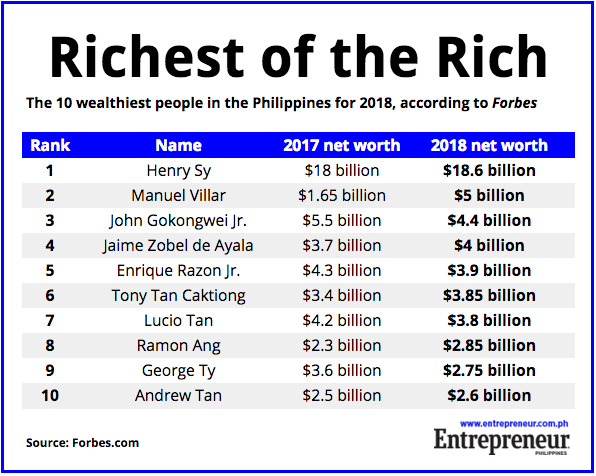 Despite tripling in net worth, he still does not surpass SM Group founder Henry Sy, who remains the country’s richest person for the 11th year in a row. He is worth $18.3 billion this year, an increase of 1.6 percent from $18 billion in last year’s list. Rounding up the top five are Ayala Group head Jaime Zobel de Ayala ($4 billion) and ports and gaming magnate Enrique Razon Jr. ($3.9 billion). Among those who saw the biggest increase in their fortunes are Ramon Ang ($2.85 billion), Iñigo and Mercedes Zobel ($2.5 billion) and Eduardo Cojuangco ($1.4 billion), thanks to their holdings in San Miguel Corp., the conglomerate that diversified from food and drinks to energy and infrastructure. Seven new entrants are part of the rich list this year. These include Josie Natori, the well-known international fashion designer ($150 million); Necisto Sytengco, a major owner in chemical trading group SBS Philippines ($180 million); William Belo, founder of housing construction retailer Wilcon Depot ($600 million); Jerry Liu of semiconductor manufacturer Cirtek Holdings ($145 million); and Rafael Simpao Jr. ($155 million) and Alberto Villarosa ($170 million) of Security Bank. Twenty-seven rich listers, however, saw their fortunes decline, including television station owners Gilberto Duavit ($135 million), Menardo Jimenez ($130 million) and Felipe Gozon ($125 million) as share prices in GMA Network slumped 11 percent. Betty Ang of noodle maker Monde Nissin lost the most as her net worth fell 70 percent to $270 million. Mining industry leaders Philip Ang and Luis Virata are no longer part of the 50 richest list as the industry continued to suffer from tough policies of the administration of President Rodrigo Duterte. All in all, the country’s 50 richest individuals are worth an average of $1.479 billion, a slight increase from last year. 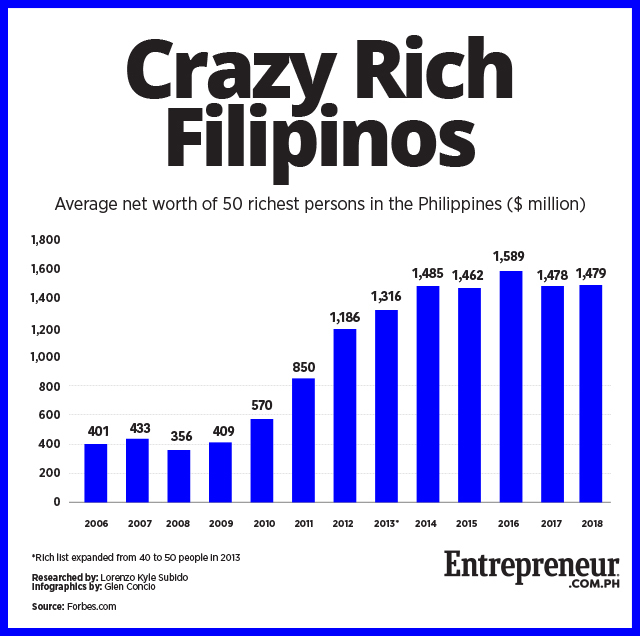 For Forbes' story on the 2018 Philippine rich list, click here. For the full list of the country's 50 richest people, click here.